When I cook Thai green curry at home, I usually buy Thai curry paste from the market, as I assume most people inside and outside of Thailand do. Most readers abroad don’t get to scoop their own green curry paste from the mound of fresh curry paste sitting open at the market stand, but they can buy it prepared by the jarful or packet. I got curious, though, and decided to take advantage of the cheap and fresh ingredients found here in Thailand by pounding my own paste, in a mortar and pestle, from scratch. 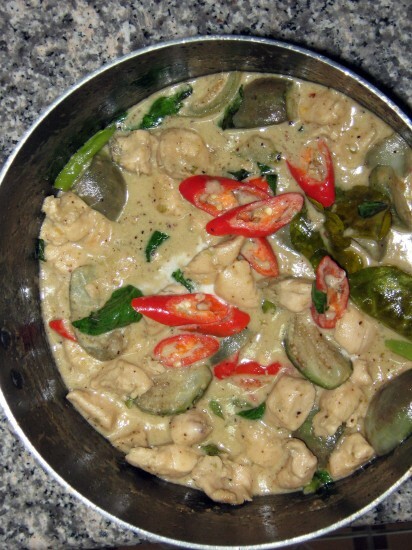 She answered, “She’s making green curry? She doesn’t need those, she needs…” as she gestured to the back of the store. “No, I’m making green curry paste.” I said, making hand gestures indicating a mortar and pestle. Standing up, she led me to a vendor selling fresh spices, “This is what you need.” she said, as she picked up a kaffir lime and some galangal. I held up my bag, “But I have that already. I think that I need these,” and pointed to the cumin seeds. By now six people had gathered to discuss how to make green curry paste. One went to consult with another vendor who seemed to know how. After this consultation, they returned and told me, yes, cumin seeds do go in green curry paste and, yes, the bag I had was indeed cumin. All of this proved a few things that I had already suspected: Thai people are really helpful and that they rarely prepare curry paste from scratch. They also think it’s really amusing when foreign people try to cook Thai food. Finally it was time to start cooking! Since I calculated that the curry could take a long time, I started preparing around 4 pm. The spices powdered quickly in the mortar after roasting them, and the chilies didn’t take much longer. To help speed things up, I chopped the fresh chilies, garlic and shallots up finely before adding them to the mortar. The shallots ground into a wet paste pretty easily, but were difficult to break into even smaller pieces. But the harder lemongrass, galangal, and kaffir lime rind were a problem. I ground these three ingredients together, separate from the wetter ones, because I expected they’d be hard to grind. After ten or twenty minutes of pounding, they had broken up a bit, but they weren’t actually pulverized. At the end it smelled wonderful, but it wasn’t a really paste but just a mix of flattened herbs. This took about an hour at which point I decided the ‘paste’ would have to be good enough. Fortunately, cooking the rest of the curry was easy. I followed the recipe but substituted chicken for beef. At the end, after tasting the green curry, I ended up frying three more tablespoons of my curry paste and adding it before serving, because I thought the flavor was not strong enough. The green curry tasted good, and it tasted fresher compared to using curry paste from the market, but it also didn’t taste as rich as I would have liked. Since I couldn’t crush the ingredients finely enough, I suppose, I hadn’t been able to extract the flavor – nor the green color from the kaffir lime rind, since the curry turned out white. Everything still tasted good, but next time I think I will stick to the ready-made curry paste from the market. If I do try it again, I found after consulting a curry expert, that the problem was with my choice of mortar – Thai curry paste is best made with a heavy granite stone mortar and pestle instead of ceramic. 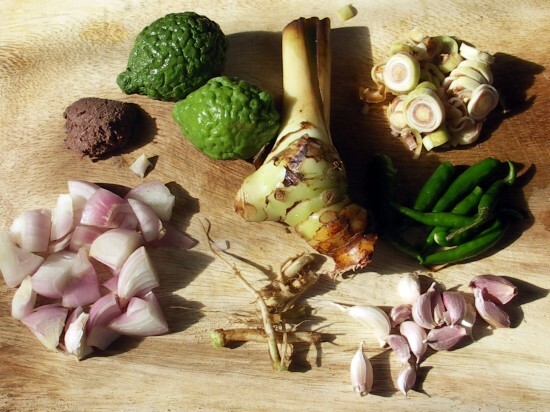 She said you can make curry paste easily in less then 30 minutes (even 20 with practice) and that you should combine the wet and dry ingredients together step-by-step, as the moisture and salt helps to break up the lemongrass and galangal. The next day, I used some of the leftover curry paste for pasta in green curry sauce. 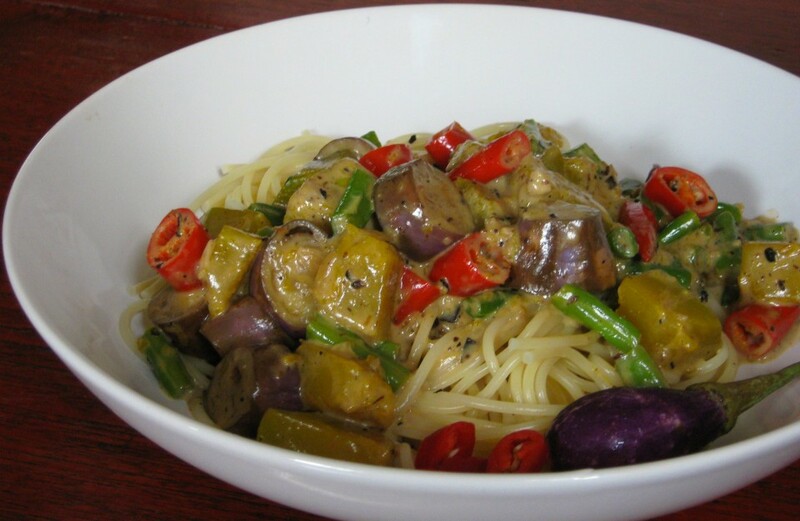 To make this dish, fry a few tablespoons of green curry paste in oil for a minute or two until fragrant, then fry a mix of vegetables briefly – I like eggplant, pumpkin, green beans, and red peppers. Add two cups of coconut milk and simmer until the coconut milk is about the consistency of an Alfredo sauce. This sauce tastes better without much added sugar, as it resembles a European-style cream sauce, with more depth and spice. Pour over enough cooked spaghetti for two and serve hot. And of course there’s always this prepared curry paste option. After this experiment, I’m using pre-made pastes pounded by vendors who have been making green curry for much longer than I have. When I leave Thailand, though, I expect I’ll need to make the paste myself to get the right flavor. Have you ever made fresh curry paste? I’d love to hear your comments if you think the taste difference was worth the effort. I can’t get many of these ingredients in Malta. It’s a pity. Your recipe worked pretty well for me, thanks. Living in Singapore I can buy some nice paste, but I miss making it, was at the wet market today, saw lovely green chillies and thought, it’s time to have another go. So I guessed at what I needed, got it mostly right (more coriander root would have been good) and we just had a very passable green curry and have paste for 10 more.